We all know the song "Superstition ain't the way." right? Whether you realize it or not, we all use acts resulting from superstition on a daily basis. I am sure you can recall back to yesterday to a conversation where you said "Knock on wood" and actually participated in the knocking of wood. Maybe your friend told you that he broke his leg and you replied that you didn't. However, this seems like bad karma so you knock on wood to prevent your potential broken leg. Now I am not a doctor, but I highly doubt that knocking on a piece of wood is going to stop your leg from breaking, but our anxiety decreases when we do so. So where did this all stem from? Back in ancient times, Pagan beliefs stated that spirits lived in the trees, so touching upon them would call upon protection. Also, knocking on the trees acted as a "Thank-you" to the spirits so that they would bring good luck. As time passed, other cultures began to use this superstition in their own ways. Irishmen believed that knocking on wood would bring them good luck from Leprechauns, and Greeks believed that since Oak Trees were sacred to Zeus, that they must gain luck from them. Regardless of how each culture views the knocking of wood, we all do it for the same reason: to ward off unlucky consequences that our anxiety driven minds bring upon ourselves. Ever notice how desperate we get to knock on wood that we knock ourselves in the heads? I mean.. whatever makes you feel better! Jacqueline, I do knock on wood all the time!! Reading this made me laugh because literally yesterday, I said knock on wood and could find a piece of wood to knock on, I'm laughing while typing this. You are right, does a piece of wood really help when it comes to the superstition, most likely not. But, it does decrease any anxiety we felt previous about talking about a situation we once felt anxiety over. It is interesting to see where knock on wood stemmed from, I found that very interesting. Jacqueline, Its crazy but everyone does it! I do it at work, home, and school and even though I know it doesn't actually do anything I don't want to risk something going wrong. I never knew where the superstition stemmed from, but it was just something we have all grown up believing in. Very interesting. 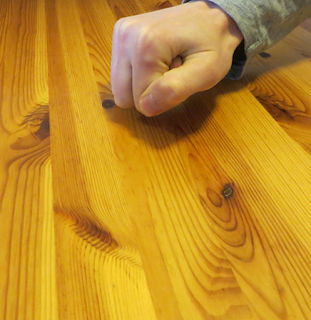 Even though it's probably non sense, I always knock on wood to prevent bad things! No matter how much I refuse to believe stuff like this, I always end up falling for it! I knock on wood on occasion, but I'm not overzealous about it. It just seems like the natural thing to do depending on the conversation. When I was younger, I used to say knock on wood and scramble around until I found wood to knock on and freak out if I was unable to, thinking bad karma was headed my way!